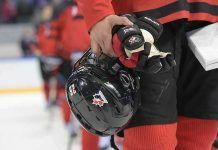 MAGNITOGORSK, Russia – Hockey Canada has announced the addition of six players to its roster for the 2018 IIHF U18 World Championship in Chelyabinsk and Magnitogorsk, Russia, beginning on Thursday. Joining the team are goaltender Olivier Rodrigue (Chicoutimi, Que./Drummondville, QMJHL); defenceman Jared McIsaac (Truro, N.S./Halifax, QMJHL); and forwards Aidan Dudas (Parry Sound, Ont./Owen Sound, OHL), Raphaël Lavoie (Chambly, Que./Halifax, QMJHL), Akil Thomas (Toronto/Niagara, OHL), and Joe Veleno (Kirkland, Que./Drummondville, QMJHL). Dudas, McIsaac, Rodrigue, Thomas, and Veleno were all part of Canada’s National Men’s Summer Under-18 Team that won the 2017 Ivan Hlinka Memorial Cup (now the Hlinka Gretzky Cup) last August. Hockey Canada will still have an opportunity to add players to the roster as teams are eliminated in Canadian Hockey League (CHL) playoffs. The Canadians blanked Slovakia 5-0 in pre-tournament action on Sunday, April 15 in Chelyabinsk, and won Monday’s final tune-up against Finland by a score of 3-2. Graeme Clarke (Ottawa/Ottawa, OHL), Kirby Dach (Fort Saskatchewan, Alta./Saskatoon, WHL), Peyton Krebs (Okotoks, Alta./Kootenay, WHL), and Nolan Maier (Yorkton, Sask./Saskatoon, WHL) – four of seven under-aged players invited to Canada’s National Men’s Under-18 Team pre-tournament camp as an opportunity to further develop and gained international experience – have returned home. The team now moves to Magnitogorsk where Canada opens the 2018 IIHF U18 World Championship on Thurs., April 19, against the United States. TSN and RDS, the official broadcast partners of Hockey Canada, are broadcasting 15 and 10 games respectively, including all of Team Canada’s match-ups at the IIHF U18 World Championship. Canada has won seven medals at the IIHF U18 World Championship, including three gold medals (2003, 2008, 2013).